MARCH WAS originally the first month of the year in the Roman calendar, and for Galway Street Club, March has long been a month signifying new beginnings, providing exciting starting points, and, especially this year, marking significant milestones. 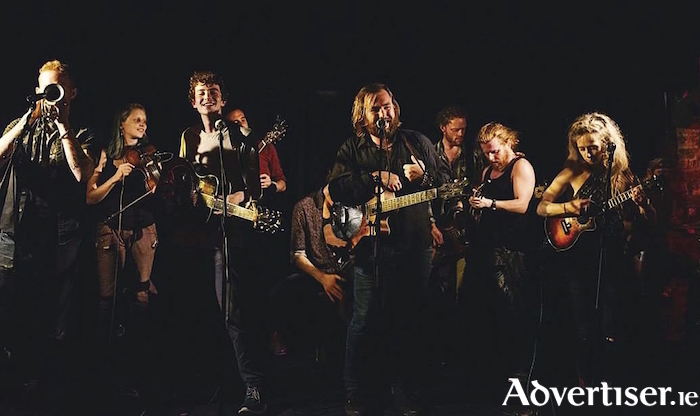 Galway Street Club was formed in March 2016, when a group of buskers got together for a jam session and found their collective interaction produced something special. March 2017 saw the group mark their first birthday by playing two gigs at the Róisín Dubh for St Patrick’s Day. This March, the Club returns to the Dominick Street venue to again play two St Patrick’s Day shows, and launch their debut album - the magnificently entitled Sovereign State Of Madness. While busking remains at the core of what the band members identity as musicians, Galway Street Club are aware that this is a time of transition. The new album symbolises their determination to expand the audiences that have been enthusiastically flocking to their shows, and to be seen, not solely as a collective of buskers, but also as a serious band. So are the days of regaling audiences on Shop Street over? Not quite. Sovereign State Of Madness is entirely self-written, and is a rousing, high energy, full blooded collection of rambunctious folk-rock, gypsy jazz, blues, roots, Irish trad, Eastern European folk, and a meeting space between all these disparate genres. The diversity speaks of the diversity of talent, nationalities, experiences, and interests each member brings, but also of the unity these musicians achieve, with all the styles blending seamlessly into a coherent whole. Among the highlights are ‘Fun Lovin’ Time’ (“If one song sums up Galway Street Club it’s this one,” declares Spud. “Energy is the key to what we do and to what we bring to the stage, it’s what we are about ); two splendid instrumentals showcasing the band’s sense of feel, dynamics, and grasp of traditional forms; the startling, unexpected heavy blues-rock of ‘Open Your Mind’ (“It’s a totally different direction from the other songs,” says Paul. “That’s Laura’s tune. We just honed the riff” ) and Spud’s own composition ‘Have You Ever Been’. Galway Street Club could be called a locally based, international ,band. As well as Texan Spud and native Galwegian Paul, the line-up is Laura Corcoran (ukelele ) from Laois; Shane Scally (cajon ), from Roscommon; Johnny Irvine (mandolin ) from Leitrim; James Dillion (guitar ) Clonmel; Paulter (trumpet ) from New Mexico; Luke Longarms (bass ) from Scariff; Dimon Nesterov (harmonica ) from Kazan, Russia; Alberto Carrasco (Spanish guitar ) from Valencia; Merle Blaubar (violin ), from Germany; Nahuel Raffaele (saxophone ) from Buenos Aires; and Kai Ferry (percussion ) from Donegal. And the band are eager to play the upcoming St Patrick’s Day gigs. Galway Street Club play the Róisín Dubh on Saturday March 17 at 5pm and 9pm. Admission is €5. Sovereign State Of Madness will be available to purchase at the shows.